So this is what history feels like. Painful, frankly. None of the usual meteorological metaphors - earthquake, hurricane, avalanche, landslide, tsunami - seem strong enough. Make no mistake, Theresa May was right. This is the biggest constitutional drama - even crisis - since the abdication. Actually, it’s bigger than that. It’s the greatest (internal) shock to the British state since the 1918 election. Sinn Fein won 47 percent of the vote in Ireland that year as it all but swept southern Ireland. The Irish Parliamentary Party lost 61 of its 67 seats, every one of them to Eamonn de Valera’s party who increased their representation from 6 to 67. As then, so now. 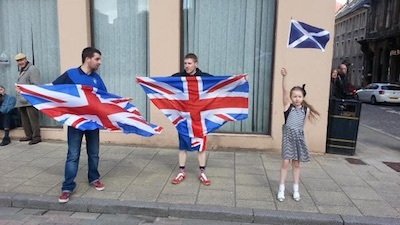 Even nationalists can’t quite believe this has happened. Motherwell! Rutherglen! Paisley! Coatbridge! Kirkcaldy! All of them places to feature in a new version of an old Proclaimers tune. But something died last night. This was indeed the end of one old song and a monumental disaster for Unionism. The United Kingdom will never, I think, be the same again. And perhaps that’s a good thing. Perhaps it is time - past time, in fact - there was a rebalancing of the constitutional apparatus. The old ways are gone and there’s no going back. If the Union is to survive it must change. The Smith Commission’s proposals seem like the floor upon which something might be built, not the ceiling of the nation’s ambitions. And, yes, that will means addressing the English Question too. The referendum taught us that Scotland is a place beginning to dream bigger things; yesterday’s results confirmed that. The SNP’s victory is a reminder that trust is the most valuable commodity in politics. Because the SNP are trusted - rightly or not - to put Scotland’s interests first they are forgiven their sins, contradictions and inconsistencies. They are held - fairly or not - to a different standard than that applied to other parties. There is little point in whining about this; it is just the way it is. This was, like all elections, a contest about many things but it was certainly a question of identity too. This is who we are; this is our party. If the scale of the SNP’s triumph is exaggerated by the first past the post system it remains the case that taking 50 percent of the popular vote is the kind of monumental victory that speaks for itself. Even Labour in all the long years of its own Scottish ascendancy never managed that. If the election was in part a heartfelt declaration of identity it was also a reminder that some causes do endure, some fights do go on and some dreams really do not die. The referendum was, to simplify matters, largely won by the votes of the old and the rich. Poorer and younger Scots voted, more often than not, for change. That should have concentrated Unionist minds. The same is true today. One by one these Labour fortresses were stormed; one by one they fell. And they did so, in part, because many voters feel fed-up, abandoned, even disenfranchised by politics-as-usual. They thirsted for an alternative, any alternative. The SNP and UKIP are, in many ways, very different parties but they share this one attribute: both are homes for some of those on the margins of society, people who have lost faith, hope and belief in the power of politics to really make a difference. That’s not the only reason the SNP did so well but it is part of the reason. And it is something to make the Unionist half of the country pause and think. Labour, in particular, must wonder how they can recover from this. Roughly thirty percent of habitual Labour voters endorsed independence last September. Most of those voters, following the granite-hewn logic of that vote, backed the SNP yesterday. Few of them seem likely to return to Labour any time soon. I remember thinking that the referendum outcome proved the worth of the Duke of Wellington’s aphorism that, short of a battle lost, there’s nothing so mournful as a battle won. This result confirms that a battle lost is substantially worse than a battle carried. Even so, it’s hard to begrudge my many nationalist friends the pleasure they feel today. So what now and where next? In truth it will take some time to determine these things. The first onus is with David Cameron to rise to the challenge posed by this result; the second responsibility lies with Nicola Sturgeon to meet that test too. Defeat necessarily demands some humility but victory is best served with magnanimity. The nationalists have every right to enjoy their triumph but the country remains as it was: evenly divided. Which leaves us in an interesting place. Time and time again Sturgeon insisted this election had nothing to do with independence. A vote for the SNP was not a vote for independence or even for a second referendum. It is fair to say that most Unionists - and, I think, many SNP supporters - did not believe her. Now those Unionists must hope Ms Sturgeon meant what she said even as many of her supporters trust she did not. Such is the way of the world. And yet, as we have had cause to note before, this is only the first part of a two part contest. The final outcome of this election will not actually be delivered until the result of next year’s election to the Scottish parliament is known. As matters stand that seems likely to produce another SNP majority - quite possibly one larger than the one they enjoy at present. That will then change the game all over again. But make no mistake, this election - north and south of the Tweed - could hardly have gone worse for Unionists or better for nationalists. So this has been, in many ways, a GUBU election: Grotesque, Unbelievable, Bizarre and Unprecedented. So much so, in fact, there’s a palpable sense of something falling and somewhere becoming rain. So be it. The people have spoken, the bastards, and we must respect their verdict. That means beginning anew and rebuilding a sense of where this country should go and what it can be. Is David Cameron the kind of statesman to rise to that kind of challenge? If he isn’t, or can’t, then the eventual dismemberment of the United Kingdom will, much more than his second term, be his true and final legacy. The end of the affair and the start of something new.